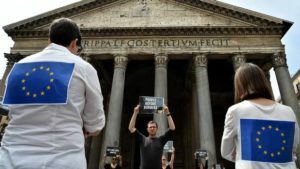 With all eyes in Europe on the June 23 Brexit vote, a survey in Italy found that 48 percent in the country that paved the way for the European Union’s creation would vote to leave the EU. An Ipsos MORI poll published in early May found that 48 percent of Italians would vote to leave the EU if a Brexit-style referendum were held. The survey also found that 60 percent of Italians think the British will vote to leave the EU. Italy, one of the EU’s six founding countries, is also its fourth-largest economy. If the British do vote to leave, and Italy were to follow, it would spell the end of the union, analysts say. Much of the ambivalence toward the EU was sparked by the refugee crisis that also triggered the rise of populist, right-wing and strongly anti-EU parties such as France’s Front National and the UK Independence Party. In Italy, the main opposition party, the Five Star Movement, is in favor of the EU but is calling for a referendum on the euro as a universal currency. A recent Pew Research Center poll found that just 51 percent of respondents in the 10 EU countries surveyed had a favorable view of the EU, and 42 percent want more power returned to their national capitals. In France, 61 percent in the Pew poll had an unfavorable view of the EU. In Italy, only 55 percent of young adults had favorable views – a surprisingly low figure given that youth support for the EU has traditionally been far higher than among older adults. “The Italians, like the French, are becoming ambivalent about the EU. … This is not the Europe we want,” said Walter Angelini, an official at an Italian state agency that controls EU aid for agriculture. Angelini said he would support an “in-out referendum” in Italy and, like Barzini, thinks Brexit would deliver a clear message to Brussels that the EU needs to be reformed.